Posted in Utensils, on August 10th, 2011. Until a few months ago I’d never heard of Bob Kramer. First I read about him in one of my cooking magazines. And then I noticed he was teaching a class at Sur la Table. My DH is the one who carves meat and sharpens the knives most of the time. Though, I’m the one who bought the Furi knives a few years ago – stainless steel ones – and also purchased a knife sharpening system from Furi too. Those I use in my everyday cooking. But we – neither one of us – seem to have perfected the sharpening process very well. Some months ago Dave spent an hour or more with all the equipment out on the kitchen counter trying to get a good edge on my most favored knives. Unsuccessfully. So, when I saw the Bob Kramer knife and sharpening class at Sur la Table, I signed us up for it. This was not a cheap expedition, I’ll tell you. The class was $100 apiece, so we decided to make that our birthday presents to each other. Also, I’ll tell you that I have lots of knives in my kitchen. Years and years ago (this would have been the early 1970’s) I’d acquired a full set of Cutco stainless steel knives. They’re very good knives, and they’ve been a sturdy go-to group all these years. I have nearly every knife they make. Once you have Cutco knives, you can send them back to the factory to be re-sharpened (no charge except for the shipping to them). But it takes a couple of weeks to get them back. A nuisance, for sure. I try to remember to do it when we’re about to leave on a vacation. That way I won’t miss them so much! In the meantime, though, I mentioned above, I bought a couple of Furi knives too – the Santoku style. And those have been my day to day knives for mincing and chopping. This Bob Kramer class, though, was fascinating. I was riveted to his every word (he’s a great story-teller) as he shared his life history and how he came to be a knife maker. A custom knife maker. But he also (now) has contracted with Henckels to make a specialized line of knives, using his lifetime knowledge of how to construct a knife (including the forging aspect of it) and sells them at Sur la Table. Some years ago he even spent time at a steel forge so he would really understand the composition of steel and the process of hand forging. He came to the conclusion after years of work that carbon steel is the only way to go to make a knife and keep it sharp. He didn’t disparage stainless knives at all; he just doesn’t use them. He finds them much harder to hone an edge, and the edge doesn’t hold as long as knives made with carbon steel. The only problem is that carbon steel will stain and discolor. He suggested that whenever you’re using a carbon steel knife keep a dry cloth next to your cutting board and use it frequently to keep the knife dry. Even water will stain a carbon steel. Kramer also sells a line of stones (sharpening stones). His are water stones (not oil, as some are), and you can buy several types. We bought one. I learned a lot about stones during the class. I remember watching my dad sharpen knives for my mother when I was a child. He’d spit on the stone and use the same round motion Bob Kramer uses. The trick is the angle. We learned that most knife sharpening units (the free standing types you pull a knife through) are set to sharpen at about 20° tilt. He recommended about 12-15°. He also explained that to get an edge you need to exert about 4-6 pounds of pressure on the knife. How do you know? Simple! Get out your kitchen scale, set a soft surface on it (like a towel), zero out the weight, then press the knife blade onto the scale until you reach 4-6 pounds. It’s a whole lot more pressure than you think. It’s clear to me that whenever I’ve sharpened knives before I’ve never exerted enough pressure on the blade. He also talked about testing the burr. That’s the little tiny edge (bend) that develops from using your knives on a hard surface (cutting boards). The chopping motion eventually curls the edge over slightly. And as long as there’s a burr, you’ll never get the knife sharp. I knew that part – from another class I took some years ago, and at that time I bought a Chantry which I’ve used with regularity ever since. Successfully. But now that I know more about better sharpening methods (using the water stone) I’ll probably retire my Chantry. In the process of sharpening he tested each blade periodically – he did the magazine test, he calls it – you take a page out of a magazine, or a piece of newsprint and cut with the knife. If it doesn’t slice right through it, it’s not sharp enough. Back to the stone it went. And he tested it at several places on the knife edge – you want that sharpness the full length of the blade. If you use a larger, longer knife for chopping, and you use the pivot method (leaving the knife point down, just picking up the back end and moving it over to continue chopping) or something close to it, you know that the bulk of the cutting action is done toward the rear – nearer the handle end of the blade. And all the way to the rear end of it too. In demonstrating the sharpening process (with the wet stone he’d soaked in water for about 20 minutes), after he’d finished sharpening each knife, he took them a couple of feet away where he had taped down a regular, ordinary piece of cardboard. Probably about 6 x 14 inches long, approximately. He gently massaged the knife on the cardboard – just like he was honing with the stone. That smooths out the edge. Cleans it, too, of any steel shavings. Then he wiped it very clean with a cloth. All of his knives are stored with a knife guard too. Good thing since they were razor sharp when he got done! You can buy those at Sur la Table also. The knives he manufactures have a few unique characteristics. All things he learned over the years of professional cooking he did, and during the years he ran a knife sharpening business (mostly for restaurant chefs) in Seattle (he doesn’t have time for that anymore). He makes all of his knives with wider blades, because he (like most cooks) uses the flat side of the blade to carry mounds of food to a bowl or cooktop. He also rounds the top of the blade (the non-cutting edge) because he learned that most professional chefs develop a mean callus from constant pressure on that part of the blade. Made sense to me! He also constructs a heftier handle. He does make custom knives (now he does an auction on his website for them – you don’t even want to know how much they sell for – but they’re stunningly beautiful) and makes different shapes of handles with different woods. This line of knives at Sur la Table, though, all have the black handles as you’ll see in the photo above. There were lots of questions at the end, which he was happy to answer. 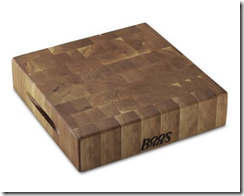 One was meaningful to me – he recommended using an end grain wood cutting board. Here’s a photo of the Boos brand available at Williams-Sonoma, although you can find them at numerous kitchenware stores. You can tell they’re an end grain because it has a checkerboard look to it – each square is an end cut of wood. The point is that chopping is what’s hard on a knife, obviously. 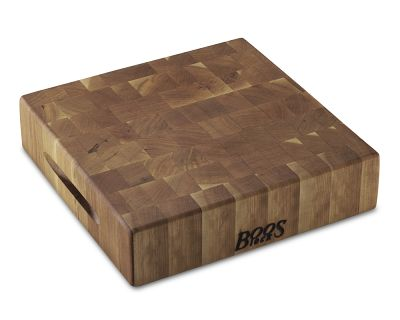 An end-grain board is softer because the knife blade will be cushioned slightly by the grain itself. He also said that bamboo boards are inherently soft, so they’re okay too. He particularly discouraged us from using the type of boards I use all the time – I have several of them, the Epicurean line (I bought them because they have a very tight grain, they’re actually some kind of wood composite, can go in the dishwasher and supposedly inhibit bacteria growth). Unfortunately, for just those reasons, the surface is extremely hard, so it’s hard on knives. I don’t own an end grain board, so guess that will need to be added to my wish list in the future. My DH had said before we went to the class, that he thought we should buy one of the knives. We did. I’d really liked to have purchased two of them, but they’re pricey. Beyond pricey, so one will be fine for now. If you want to learn more about his sharpening techniques, he has videos with better explanations than I’ve given you. Click on over to the sharpening page on his website for that. 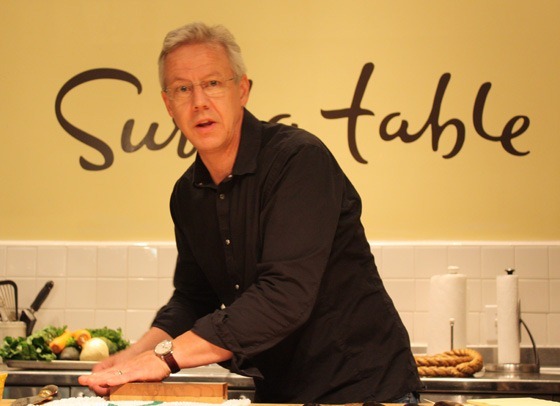 If you have a Sur la Table store near you, you might look to see if Bob Kramer is teaching there. I’d definitely recommend the class. You’re going to want to buy one of his knives, though, so take your checkbook or credit card!